Learn how to deploy to an Azure web app from a local Git repository. Now in its fourth year, That Conference is one of the premiere developer community events in the Midwest. Most attendees come from the upper Midwest, but dozens of speakers traveled from all over the country to share their knowledge. Like many code camps, That Conference features classroom-style presentations, an Open Spaces area for interactive discussions, booths for attendees and sponsors to interact, and food (good food!) in a common dining area. What sets apart That Conference is its emphasis on family. The conference drew 800 attendees and speakers, but nearly 400 family members accompanied them. It was not uncommon to see strollers pushed down the conference hallways between sessions. Family attendance did not happen by accident. That Conference is held at the Kalahari resort, which features a huge water park - ideal for family activities. The conference even reserved the water park one evening after the normal closing time for the exclusive use by attendees and their families. Best of all, the conference organized a kids' programming track to teach children about software development and computer science in a fun and engaging way. In fact, many of the sessions in this track were delivered by children - usually the kids of attendees or speakers. I was happy to be a part of That Conference this year - as a sponsor, speaker, and attendee. As a sponsor, I coordinated Microsoft's presence at the event. Microsoft was the Principal sponsor (the highest level available) and we promoted the theme "Microsoft Is Open" to emphasize Microsoft's support of Open Source Software and non-MS technologies. As a speaker, I delivered a presentation titled "Microsoft Azure Without Microsoft" in which I talked about how developers using Open Source and other technologies could take advantage of the Azure platform. I organized an open space after my session where I heard how others are using Azure with their own sets of tools. Two people from a nearby open space ended up joining my group. As an attendee, I sat in on a couple sessions (Wade Wegner's talk on Azure Apps was very interesting), sat in a couple open space discussions, and had numerous conversations with others at the conference. It was great sharing ideas with developers from different technologies and geographies. 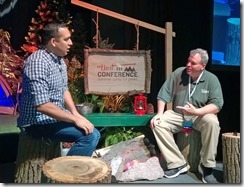 I was excited to be interviewed by both Seth Juarez of Channel 9 and by Jason Young and Carl Schweitzer for their excellent MS Dev Show podcast. I conducted a few interviews of my own, which will be released over the next few weeks at Technology and Friends. Of course the content was great and included keynotes from software craftsmanship advocate Robert “Uncle Bob” Martin, Ionic framework creator Max Lynch, and FBI Special Agent Byron Franz, along with breakout sessions on a wide variety of technologies. I wish I could have attended more presentations at That Conference, but I came away with some new connections, some new ideas, and a lack of sleep. Last week, I had a chance to attend, sponsor, and present at the Midwest JS conference in Minneapolis, MN. This conference featured very little Microsoft technologies and most of the attendees did not development with Microsoft tools. A quick glance around the room revealed more Macs than PCs. I was nervous because I didn't know many attendees and speakers and because I didn't know how they would respond to a Microsoft employee in their midst. It turns out that I worried for nothing. I met so many people who were interested in hearing about what Microsoft was doing. Our support of open source technologies the past few years really resonated with this crowd and there was a lot of interest in tool like TypeScript. I created a talk on Microsoft Edge - the new browser that ships with Windows 10 and replaces Internet Explorer. The audience was interested in the speed of this browser (it's a total rewrite of the rendering engine) and with its support of web standards. During Q&A, one attendee expressed frustration that the Edge team had not announced a version for the Mac. It wasn't long ago that a non-Microsoft conference would have also been an anti-Microsoft conference. But I experienced none of this. Everyone I met kept an open mind about other technologies - including ours. And I learned a great deal from them about the tools and frameworks that they embrace. In this screencast, I show off some of the features of Microsoft Edge - the new browser included in Windows 10 - that help end users be more productive. In this screencast, you will learn how to create your own table linked to an Azure Mobile Service and manage the data in this table from a client Windows or Windows Phone application. At CodeStock last month, I was asked to participate in a Mobile Development Panel. The panel consisted of Ed Charbeneau and Michael Crump were also on the panel, while Sam Basu moderated. A late cancellation left them with an open chair, so Sam asked me to step in at the last minute. I quickly agreed in part because Sam and Michael are old friends and because the other three participants are Developer Advocates for Telerik – a company I’ve worked with in the past and admire. Ed Charbeneau recorded the panel and released it as an episode of his Eat Sleep Code podcast. You can listen to the panel at this link. In this screencast, you will learn how to turn on authorization in an Azure Mobile Service and allow users to log in with their Twitter account.